Mechanical Traction - Pamela Morrison Pelvic Pain Physical Therapist, P.C. Mechanical Traction - Pamela Morrison Pelvic Pain Physical Therapist, P.C. 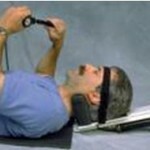 Therapeutic spinal traction uses manual or mechanically created forces to stretch and mobilize the spine. Both manual and mechanical traction ‘stretches’ the neck and is effective yet more force can be applied with mechanical traction and is a prescribed treatment for some patients. With the patient lying on his or her back, a head halter or cushioned cradle is placed under the back of the head which is attached to a machine. The machine is set for a certain time period and a specific amount of traction force is applied for the pulling action to occur. The traction can remain on steadily for the specified time (referred to as continuous or static) or intermittently (on/off cycle) during the treatment session. Mechanical traction is a highly successful alternative to surgery for disc injuries such as a bulging disc or herniated disc. Mechanical traction reduces the pressure on discs and nerve roots through a gentle traction force, expanding the space between the vertebrae. It gently stretches the muscles and connective tissue of the neck and promotes improved circulation and exchange of fluids within the disc. This modality is also effective in treating neck pain and spasms, pinched nerves, shoulder and elbow pain, headaches, and associated carpal tunnel syndrome.